The shoulder joint is the most flexible joint in the body. Anatomically, it is constructed so that a relatively large head of the humerus in contact with a lot of smaller joint surface on upper arm bones. Therefore, shoulder joint is quite unstable. Dynamic stability (stability when performing movements) is obtained by numerous ligaments and muscles surrounding it. 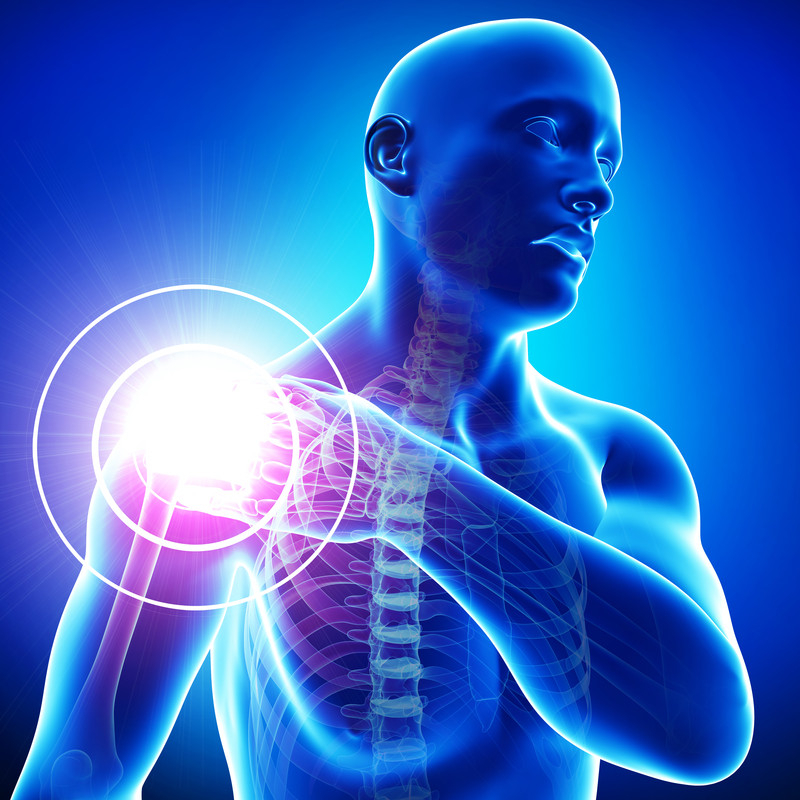 Changes in muscles, ligaments and tendons are one of the most common reasons that lead to shoulder pain syndromes. Calcification, muscle tears, bursitis, inflammation in tendons are just some of the reasons that cause pain in the shoulder area. Pain is usually triggered by a sudden movement, a fall on the shoulder (without fracture), and sometimes the pain occurs suddenly without any mechanical cause. Often sudden pain occurs during sleep. The pain may be extremely strong, so that the patient is not able to move the arm without additional pain. Due to pain, movement is limited and daily activities are disabled such as dressing, showering, etc. During the examination, by pressing certain shoulder areas, the cause of pain can be specified. The patient usually spares the affected arm, which remains joined to the body (abduction contracture). If such a situation lasts for a long time or is left untreated, it may cause permanent limitation of motion in the shoulder joint in almost all directions. Achieving the full range of motion in such conditions can be rather difficult and time consuming. It is therefore important to start treatment of acute painful shoulder as soon as possible, in the following way. Regardless of the cause of pain and pathological substrate, pain should be reduced by applying local compresses or ice to the painful area or massaged for few minutes with ice several times a day. Development of previously mentioned contractures by armpit pads is helpful, thereby achieving space between hands and body. By putting pads under armpit and gradually moving away from the body can slightly increase normal range of motion. The use of non-steroid anti-rheumatics (or analgesics) may help prevent pain, particularly in the first few days of illness. Calming the acute phase, the remaining pain can be alleviated by applying some of the analgesic physical procedures, TENS. At this stage, it is basically recommended to avoid heat because of possible deterioration of shoulder stiffness. The most important procedure is certainly movement therapy or medical gymnastics, the application of which should restore full mobility of the shoulder. Exercises are usually performed for each patient individually and in a relieving position. Treatment is given depending on the condition of the person, for 30-60 minutes.